Mike’s note: This is a guest post from Nisiprius — a prolific, anonymous member of the Bogleheads forum from whom I (and many other investors) have learned a great deal. When he’s not sharing his wisdom with us, he is a semiretired software engineer who lives in the New England area. Recent changes in Vanguard’s website look to me as if Vanguard has tightened its focus on indexing and on simplicity for personal investors. But isn’t “Vanguard advocates indexing” the non-story of all time? Vanguard used to include nine funds in their “core” category. 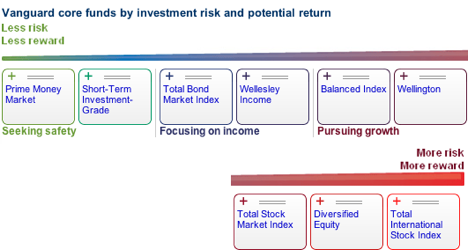 Besides Prime Money Market, the other eight were perfectly split between index funds (Total Bond Index, Balanced Index, Total Stock Market Index, and Total International Stock Index) and actively managed funds (Short-Term Investment-Grade Fund, Wellesley Income, Wellington, and Diversified Equity). Today, however, Vanguard names only four “core funds”: Prime Money Market, Total Bond, Total Stock, and Total International. They suggest a decision framework that calls for first choosing a stock/bond/cash asset allocation, then implementing it with these funds. On Vanguard’s personal-investors’ website today, almost all roads lead to Total Bond, Total Stock, and Total International — either directly or via “all-in-one” funds-of-funds which are mostly simple three-fund portfolios of the core funds. Actively managed funds are out of the spotlight. Today, a retail investor who begins at Vanguard’s main page and starts exploring is probably not going to find Wellington unless she is looking for it. You can find it by searching by name or by looking at the “all funds” table, but you are not likely to stumble across it by clicking your way through Vanguard’s fund decision pathways. But now, Vanguard’s new core funds page does not invite investors to think in terms of “core” and “satellites.” In the Bogleheads forum, the phrase “three-fund portfolio” is used to refer to a portfolio which uses only basic asset classes — usually a domestic stock ‘total market’ index fund, an international stock ‘total market’ index fund and a bond ‘total market’ index fund. The core fund page is now an illustration of how to build exactly this kind of three-fund portfolio. Fidelity Freedom 2040 uses no less than 20 funds. It’s worth noting that, until 2010, Vanguard’s Target Retirement funds were slightly more complex — owning three separate funds (Europe, Pacific, Emerging Markets) in the place of Total International. The same theme is evident in recent changes to Vanguard’s LifeStrategy funds. These funds-of-funds are all-in-one portfolios for specific life stages or specific degrees of risk tolerance that hold a stable allocation over time. However, they used to include a significant slice of the Vanguard Asset Allocation fund, a “tactical asset allocation” fund that shifted back and forth between stocks and bonds in response to “quantitative models.” Because the LifeStrategy funds owned this Asset Allocation Fund, they also shifted stock exposure up and down. In late 2011 however, Vanguard revamped these funds and they are now, yes, simple three-fund portfolios with fixed allocations. The retail website does have a path guiding the investor to Vanguard’s Managed Payout funds, which do not fit the pattern. They use a university-endowment-like strategy and employ nontraditional assets, and tactical allocation. Launched in 2008, they hit a perfect storm, and to date have attracted only $0.747 billion in assets. They are certainly not “simple three-fund portfolios.” Nevertheless, each invests over half of its portfolio in, you guessed it, Total Stock, Total Bond, and Total International. How far does Vanguard’s emphasis on the four “core funds” go? If I’ve added the right things, the “total assets” numbers for Prime Money Market + Total Bond + Total Bond II + Total Stock + Total International add up to $510 billion. That’s a huge number, but it’s only 30% of Vanguard’s total holdings of $1,700 billion. And by one count Vanguard offers more actively managed funds (67) than index funds (53). The risk/reward relationship is likely the most fundamental concept of finance. But “risk” is such a vague term that I think it can be helpful to break it down into more tangible components. When it comes to money, time is a key ingredient. It can take an otherwise very risky investment and make it significantly less risky–possibly even conservative. For example, a friend of mine is buying a condo in Manhattan. While prices have come down recently, they are still astronomically high. My buddy is worried about buying this condo because he fears that prices might drop. If he does buy the condo, the reward is pride of ownership and (possibly) a good long-term investment. But the risk that he’s thinking about is the risk of overpaying for his pad. Why is he thinking about that? He’s completely forgotten about the element of time. He’s not going to sell his condo this year or next. He’s not going to fund his down payment by going into credit card debt. He’s got the cash just sitting there. And the odds are, he’ll hold on to that place for the next 20 years. It doesn’t matter what the price of the condo does over the next few years because that will have no impact on him. When you think about risk and reward, don’t forget about time. Consider your risk over your intended or likely time frame. The next component of risk is probability. Yes, it’s important to understand what a bad outcome might look like, but in order to make a good decision, we have to be mindful of the chances of something catastrophic happening. Think about driving your car. There is always the possibility of getting into a terrible accident when you get into an automobile. But the odds of a catastrophic accident are so remote that most people don’t have a problem getting into a car and driving downtown. Investments are no different. When you make an investment, there are always risks. You can take steps to reduce those risks, but you can never eliminate them. Because risk exists, does that mean you shouldn’t take action? It may…if the probability of that bad outcome is significant. But if the probability is very low, you (usually) shouldn’t let it stop you. The final component of risk is magnitude. The odds of something happening might be very low, but the magnitude of the consequence might be so great that you still can’t take the chance. Consider robbing a bank: Even if you have what appears to be the perfect plan, it’s a bad move. The idea of going to jail is so repulsive that it makes the proposition a non-starter. In this case, the magnitude of the consequence is so high that it almost doesn’t matter that the odds of experiencing that negative outcome are low. Similarly, even if you have a “sure thing” investment, it’s still important to diversify. If you put everything into one ostensibly low-risk investment and that one-in-a-million bad outcome occurs, your life savings will be history, and you won’t have enough money to retire. When considering magnitude of risk, rather than thinking in terms of dollars, it can be helpful to think in terms of impact. For example, Bill Gates can lose $10,000, and it won’t impact him at all. He can still live on any island he likes. You might also be able to lose $10,000 without it having a huge impact on your life. But somebody struggling with debt can’t afford that risk. Such a loss would be a game-changer and, therefore, not an acceptable proposition. In summary, when investing, you need to understand what you are risking, how likely that risk is to appear, and how the magnitude and probability of that risk change over time. About the author: Neal Frankle is a Certified Financial Planner in Los Angeles and runs Wealth Pilgrim.com–a personal finance blog for people interested in making smart decisions about their money.